The Nassios & McLaughlin law firm was formed in 2002. Both Mike Nassios and Tim McLaughlin have extensive trial experience throughout their legal careers. Mike worked for many years as a prosecutor in the Knox County Attorney General's office. Tim worked in the Knox County Public Defender's office. 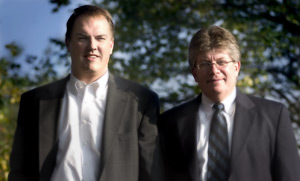 In the 1990's both Mike and Tim became employed at the Law Offices of Peter G. Angelos, a nationally recognized plaintiff's law firm, in their Knoxville, Tennessee branch office. During these years, Mike and Tim handled complex civil cases for individuals that were exposed to toxic substances. During these years both attorneys handled numerous personal injury cases including automobile accidents, worker's compensation cases, medical malpractice cases and represented citizens that had been accused of criminal charges. Nassios & McLaughlin is a law firm that represents people that have experienced unfortunate circumstances. Their law practice is limited to representing people that have sustained personal injury, have been involved in motor vehicle accidents and individuals that have sustained an on-the-job injury in cases under the Tennessee Worker's Compensation laws. Nassios & McLaughlin handles serious medical malpractice cases along with serious products liability claims. Nassios & McLaughlin have extensive experience in the area of chemical exposure, toxic exposure and occupational exposure to various and harmful substances. This area includes their handling of asbestos and mesothelioma claims. An area of this practice includes assisting workers or the worker's family members in the filing of Department of Energy Employee Occupational Illness Compensation claims. If you would like to discuss your case with us and see if we can be of assistance, feel free to give us a call. We will advise you of what your options are and give you a honest, straight forward answer.